It had been nearly 20 years since “Where the Wild Things Are,” but at the age of 53 Maurice Sendak completed the third book in the trilogy. I didn’t read this book for years, because it looked disturbing – and it is. On the title page, there’s a little girl teaching her baby sister to walk, and they pass a white picket fence, and an enormous bush of daisies. But sitting at the end of the fence is a hooded mystical figure. It could be the grandson of Death, and Sendak’s answer isn’t much more comforting. They’re goblins – and they’ve come to kidnap the little girl’s baby sister. There’s even a second title page – spanning two pages – in which three more of the hooded goblins arrive. 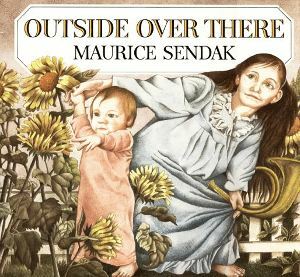 Sendak has come up with another grand and mysterious fairy tale. “When Papa was away at sea,” he begins, in a fancy font on a grand two-page spread. Sendak draws a yellow sky over a ship in the harbor, with a mountain on one side and on the other a beautifully-detailed drawing of a tree. The little girl, named Ida, stands in the middle, holding her baby sister next to her mother on the rocks – and two more of the hooded goblins on the left. ” On the next page, there’s a different view showing a whole forest of his detailed trees, plus a gorgeous leaf-colored trellis, a husky dog – and two hooded goblins, now carrying a ladder. They’ll use the ladder to kidnap Ida’s baby sister when she isn’t looking. Sendak hides surprises in every picture. While Ida plays her horn, the leaves of a daisy vine poke into her room through another window. But in the next illustration, they’re already starting to bloom, and soon there’s enormous daisies intruding into her bedroom. Meanwhile the other window, where the goblins escape, inexplicably becomes a view to a ship on the ocean. And in the next illustration, it’s a stormy sea where lightning strikes over the sinking ship. And the story gets more and more magical. Ida floats on her yellow rain coats, “whirling by the robber caves,” and it’s one of the most beautiful drawings in the book. There’s a white moon turning the clouds silver, that frame the girl’s yellow raincoat – just her face peeking out of the center. Below her is a horizon filled with detailed trees – and presumably under the ground, a cave with stalactites and a burning flame where two goblins wait by a moonlit ocean. Eventually Ida confronts the goblins, who’d hoped to turn her sister into a goblin bride. Just like “Where the Wild Things Are,” Ida triumphs in a magical world – and then returns home to her loving family.